Together we are working towards zero new infections, zero discrimination and zero AIDS-related deaths. Since 2005, the number of people dying from AIDS-related causes worldwide has decreased by six million. New HIV infections have fallen by a third since 2001. More people than ever are accessing the treatment they need to remain healthy and strong. But that doesn’t mean it’s time to stop taking action. Together we can ensure that this reversal continues. The Tide is Turning Against HIV and AIDS. The Presbyterian Church in Canada is actively working with partners around the world to help people fight against stigma and discrimination, provide access to counselling and HIV testing, and teach and equip people to prevent its spread. Care is provided to people living with the disease and support to orphans and vulnerable children. We are working towards a world where there are no new cases of HIV and where mothers don’t worry about transmitting the disease to their children. We are living in hope of the time when no more people die of AIDS. This World AIDS Day, we continue to live in hope. As we reflect on the challenges and successes in the fight against AIDS, let us keep in prayer those whose lives remain affected. Be a Person of Hope! You can inspire others to learn more and help fight AIDS. Talk about AIDS with family and friends. Advocate for treatment for all. 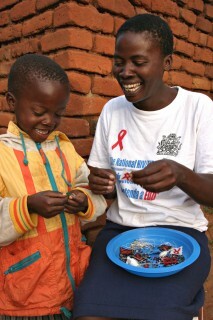 Generously support HIV and AIDS programs by raising funds for PWS&D. Together we live in Christ’s hope. Donate Today! Donations can be made online, through your church, by mailing a cheque to the PWS&D office or by calling 1-800-619-7301 ext. 291. Contact Anna Muir to order copies for your congregation.